Apple announced the entirely new iPad Pro 10.5 and the updated iPad Pro 12.9 at the WWDC earlier this month. 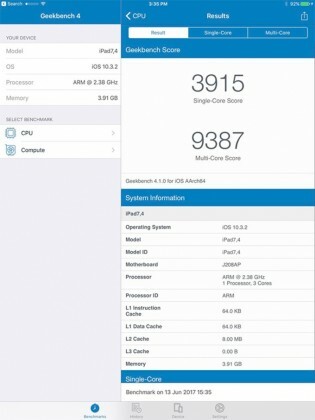 The company as usual did not reveal the RAM, but benchmarks filled that the new slates have 4 GB RAM. Both tablets unsurprisingly scored similar results on the Geekbench tests. Both iPads come with latest Apple A10X Fusion chipset, which offers up to 30% better performance than the last generation. It has six-core CPU, three cores are high-powered, and the other three are power-saving. 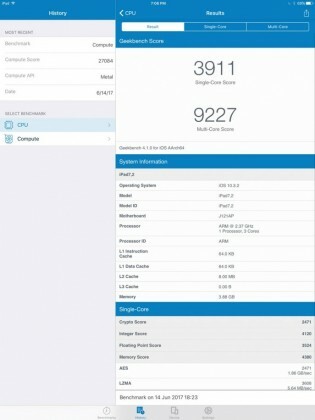 The results also confirm monstrous performance - single-core is over 3,900 points, while the multi-core results go north of 9,000 points - considerably more than any other device on the market right now. The two slates are already on sale - the smaller iPad Pro starts from $649, while the 12.9 version base version is $799. Talk about pathetic resolution of iPhone 7 versus Quad HD of S8.